Huang Di said, “May I dare ask how the nine needles began? “One is in accordance with laws of heaven. Two is in accordance with the laws of earth. Three is in accordance with the laws of man. Four is in accordance with the laws of seasons. Five is in accordance with the laws of the tones. Six is in accordance with the laws of the pitch pipes. Seven is in accordance with the laws of the stars. Eight is in accordance with the laws of the wind. possessed the numerology, one to nine. “The first is the chisel needle. It is patterned after a sewing cloth needle. The second is called the round needle. It is patterned after those needles for working cotton. The third is called the spoon needle. Its pattern is a tip like a grain of millet. The fourth is called the lance needle. It is patterned after the needles used for working cotton. The fifth is called the sword needle. 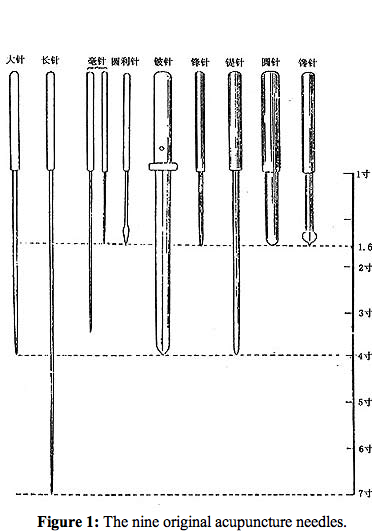 The sixth is called the round and sharp needle. It is patterned after the hair from a horses tail. The seventh is called the hair-fine needle. It is patterned after a fine hair. The eighth is called the long needle. It is patterned after needles for embroidery. The ninth is called the big needle.